The super-chimney will cool the Earth atmosphere by facilitating the heat exchange, and this is the most important aspect of the super-chimney. If we think of Global Warming, we should understand that the phenomenon is caused not by the planet receiving more heat but rather by increasing the heat capacity of the atmosphere due to the greenhouse gases. Respectively, the super-chimney will change the amount of heat exhaled by the planet. It will accelerate the rate of the heat exchange in atmosphere, which will result in the reduction of the Earth atmosphere temperature. There are three cooling mechanisms for air: convection, conduction and radiation. Without getting into fine details, for our planet it means the following: the planet at large receives and looses energy only via radiation, thus radiation actually is deciding factor on how much heat the planet receives. As for the air processes within the atmosphere, convection and conduction are the two determinative powers. Normally, heat radiation comes from sun and then it is partially absorbed by the atmosphere while it travels through. Then the heat radiation is partially absorbed by the planet surface. The other part of heat radiation is reflected back into space. The reflected heat travels back through the atmosphere and naturally, part of it is again absorbed by the atmosphere. 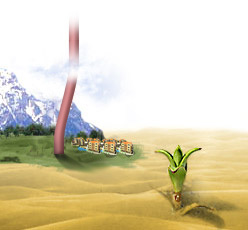 The super-chimney will facilitate air convection by bringing masses of warm air at high altitude, resulting in the warm air coming out of the super-chimney exit. When the heat from the air radiates out it will be already at high altitude thus the amount of energy reabsorbed by the atmosphere will be less, because there will be a thinner layer of air for heat to travel through. Therefore, more heat will be leaving the atmosphere, thus, reducing the atmosphere temperature. Additionally, as it was explained above, the super-chimney will create rain and clouds. Clouds will be reflecting some sunlight thus, additionally cooling the atmosphere by reducing the total amount of sun radiation received by the planet. According to the calculations, it will take 10-25,000 super-chimneys to offset the heat surplus in the Earth depending on the size. Atmosphere, which causes Global Warming. (See Attachment A: Calculations). The calculations do not take into account that the super-chimney will cause extensive cloud formations, which will increase the amount of sun radiation reflected back into space.Thus, we have real opportunity to offset the effects of Global Warming by using super- chimneys.